The Weeks Division of MyMac Labs get plenty of iPhone cases to review. Some are better than others. 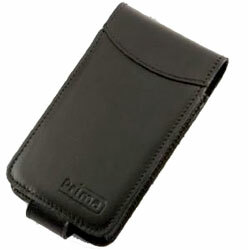 Unfortunately, Prima’s Premium Leather Flip case does not fall into the “better than others” category. While our review case was nicely made of leather, with several slots for credit cards or licenses, Prime seems to have not understood what makes a useful iPhone case. 1) The case itself is well made, using good quality leather. 2) The flip case has a snap to keep the cover closed. A snap is a better choice than a magnet, according to Prima, as iPhones and magnet don’t get along too well together. That’s nice, but the snap is on the -back- of the case, so it’s awkward to unsnap. Moreover, the snap needed an excessive amount of pressure to snap shut. The manufacturer says the snap should loosen up with time. I did not use the case enough to verify this. 3) The case has a hole on top for the headphone cord, but when the cord is plugged in, you cannot fully open the flip cover, as the cord gets in the way. Plan on having to use the iPod functions with the case closed. 4) On the review case, the camera lens cutout on the back did not quite line up with the camera lens on the iPhone. I asked Prima, and the representative said that some early cases had this problem, but it has since been corrected. Check yours to make sure. Mobile phone and iPod cases are a very personal choice. Speaking for myself, I’m not a flip case enthusiast, as I’ve never really understood the point of a flip case for an iPhone. To use the Prima, you have you unclip it from the belt clip, as you cannot easily remove the iPhone from the case. Then, you have to unsnap the cover. While talking, you have to deal with the cover flopping back and forth as you try to talk. If the point of the flip cover is to provide protection for the screen, Prima’s cure is worse than the disease. If you like flip cases, the Prima could be worth a look. But it’s not my cup o’ tea.